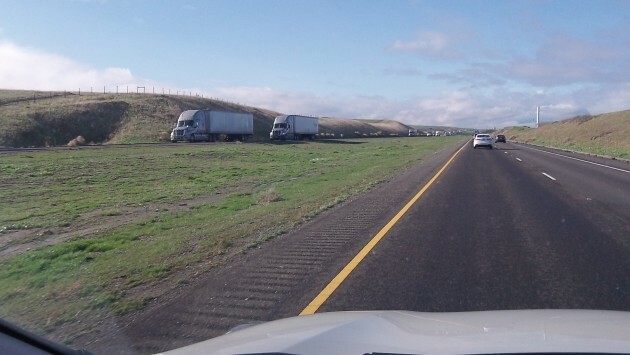 Like here on I-5 in California, 70 mph will be the legal speed on I-84 from The Dalles to Idaho starting in March. No, ODOT says, the new signs announcing higher speed limits on highways east of the Cascades are not quite as expensive as officials had projected. Still, getting ready for the speed change authorized by the 2015 legislature is not a simple matter of just putting up new signs where the old ones used to be. A reader called my attention to a Jan. 17 story on OPB, which reported the new signs were costing about $1,700 each, which seemed a little stiff. Actually, Peter Murphy of ODOT told me Friday, that amount was an early estimate provided to the legislature. He said the highest cost for a sign he had seen was about $1,100, suggesting that most were costing less. Whatever the amount of the 900-1,000 signs made necessary by the law change, it’s an internal cost to ODOT that includes whatever the agency allocates for its employees to design, engineer, produce and then install highway signs. In some cases where additional signs are called for, even an archaeological evaluation is required before a crew can did the hole for a new post. Why additional signs? Because the speed change means some will be needed in places — ahead of curves and outside of towns, for instance — where none were needed under present speed limits. West of the Cascades the top legal highway speed limits stay unchanged: 65 on the freeway and 55 on other roads. But as drivers know, the actual average speed on most rural sections of Interstate 5 is somewhere around 75 as long as no troopers are in sight, which is almost all the time. Many years ago the legislature authorized the Transportation Commission to raise the legal limit on I-5, but the commission has refused for reasons of safety. So what the hell is your point? Sometimes the point is to scratch a mental itch and talk about what’s been found. There could be a significant saving if they stopped putting those extra signs on every post with a 10 MPG lower speeds for trucks. There is no logical reason for holding their speed lower than cars. It does give everyone the impression that the roads are lousy with trucks because they are always passing one. Try driving a rural highway where everyone is limited to 55 MPH and notice how you see fewer trucks other than the oncoming ones.